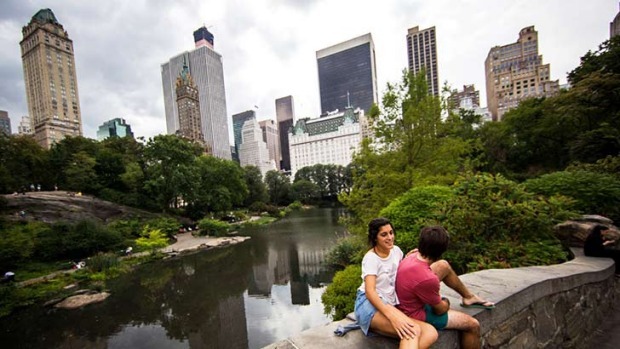 With its endless trails, hidden nooks, museums and nearby night spots, Central Park is that rare tourist destination that is also a pleasure ground for locals. Video by the New York Times. From Memorial Day (the last Monday in May) to Labor Day (the first Monday in September) New York buzzes with festivals, parades and outdoor events. August can be unbearably humid and low-key as New Yorkers flee to the beach en masse. That's right, New York has beaches! September has gorgeous weather but by mid-October you'll need a good jacket and scarf. Pumpkins appear on stoops, storefronts and menus as Halloween approaches in late October, and the autumn leaves are usually at their peak in early November. New York really throws itself into the holiday season which makes December a fun time to visit. January and February are bitterly cold, with temperatures dropping below freezing for weeks at a time. A heavy-duty coat and snow proof boots are essential. March is still cold and sometimes snowy, but come in May and you'll be treated to Central Park in bloom and 8 million New Yorkers in the best mood they've been in for months. International flights usually land at either John F. Kennedy International or Newark Liberty International in New Jersey. Both airports are roughly equidistant from midtown Manhattan but JFK is the busier of the two; clearing immigration and custom there can take over an hour. Both Newark and JFK have an Airtrain [https://www.panynj.gov/airtrain] that connects to the public transport system. If you're a confident navigator this is the most affordable way to get into Manhattan and is often the fastest too—you can usually get to Penn Station in under 40 minutes for $12-$15. Shuttle services such as NYC Airporter [http://www.nycairporter.com] and the Newark Airport Express [https://newarkairportexpress.com] will drop you in midtown for less than $20, but travel times can vary according to traffic conditions. If you want to go directly to your hotel with as little effort as possible, drop some dollars on a cab. I mean a real one from the taxi rank, not one of those guys soliciting business at the arrivals gate. From JFK to Manhattan there's a flat rate of $52, although it usually amounts to more than $70 by the time you add surcharges, tolls and a tip. (Yes, you need to tip your taxi driver). If you have Uber on your phone, they currently offer a $35 flat rate between JFK and Manhattan using Uber Pool, which is a great option if you don't mind sharing a ride. ATM machines are plentiful but the non-bank ones found in stores and restaurants will usually charge a higher withdrawal fee. You may be able to avoid withdrawal fees altogether if your bank has a global network agreement like the one between Westpac and Bank of America. Credit cards are widely accepted, including in taxis, which will save you from shuffling through a wad of inexplicably identical-looking notes searching for the right denomination. Most retail items are cheaper in America but price tags can be deceiving because they don't include sales taxes. That means you're in for a nasty surprise at the checkout when an additional 8.875% is added. There's no VAT refund system to get that money back, which is why some larger department stores like Lord & Taylor, Macy's and Bloomingdale's offer a 10-15% discount to international visitors. You have to tip everyone and you have to tip them a lot; the sooner you get over it the less it will feel like you're being ripped off. The standard tip at a restaurant is 15-20%, a quick way to calculate the amount is to look at the tax on your dinner bill and double it. Tip taxi drivers, hairdressers and manicurists the same amount. Leave your bartender $1 per drink or more if it's an upscale joint. If you're staying in a full-service hotel, keep a stack of singles handy for doormen ($1-$2 for hailing you a cab), porters ($1-$2 per bag) and housekeeping ($2-$5 per day). It might feel like you're bleeding money but hospitality workers earn below minimum wage on the assumption they'll make it up in tips. Don't take your frustrations with the system out on them. New York's underground rail system runs 24 hours a day and is an excellent way to get around the city. However the MTA (Metropolitan Transportation Authority) isn't great at communicating service changes like delays or reroutes, so it's a good idea to consult the internet before boarding. A free navigation app like Citymapper or Transit App will suggest routes based on real-time subway information, and tell you how long it would take to walk or take a taxi instead. New York is well known for its yellow cabs, but you might not be familiar with the green "Boro" taxis which were introduced in 2013. They can only pick up passengers outside of Manhattan so don't bother trying to hail a green cab near Times Square or the Met Museum. To ascertain if a taxi is available, look at the lights on the top. If only the centre light (the taxi's medallion number) is on then it's available; if the two "off duty" lights on either side are lit then it's not picking up fares. No lights at all means there's a passenger inside already. If that's too confusing then just stick your arm out and eventually someone will stop. New York is an extremely walkable city and it's also surprisingly cycle-friendly. Manhattan alone has more than 385 kilometres of cycle paths which you can enjoy using Citi Bike. The blue cruisers are parked all over the city and are intended for short commutes of 30 minutes or less, which is more than enough time to get from, say, Soho to the 9/11 Memorial. A day pass costs $12 and a three-day pass costs $24, and you get unlimited half-hour rides within that period. Cyclists are not legally required to wear helmets in New York so be sure to ride carefully—and watch out for pedestrians. New Yorkers are incorrigible jaywalkers. For a taste of what living in a tiny New York apartment is like, check out the two Pod Hotels [http://www.thepodhotel.com] on the East side of Manhattan. The rooms are miniature but well-designed, ideal for travellers who just want a clean, comfortable place to sleep and shower. When you need to stretch out, there are roof decks and funky common areas to hang out in. One location even houses a taco restaurant by Michelin-starred chef April Bloomfield. The Citizen M Times Square [https://www.citizenm.com] is basically a four-star version of a pod hotel. The rooms are still compact but they feature king beds, rain shower heads and Samsung tablets that let you control everything down to the colour of the mood lighting. Most of your time in will be spent in the lounge room-like lobby, or perhaps the hotel gym if you're one of those people. But what you're really paying for is the location between Times Square and Central Park. The Beekman Hotel [http://thebeekman.com] is brand new but the building is not—the landmark structure was built in 1883 and was one of lower Manhattan's first skyscrapers. Now restored to its former Victorian glory, it has been reimagined as a luxury hotel within walking distance of One World Trade Center, Wall Street and the Brooklyn Bridge. The best rooms are around the magnificent central atrium, an original architectural feature that makes this one of the most photogenic hotels in New York.